I had just finished watching Jorge Ameer’s newest film and honestly I did not know what to think about it except that it had totally pulled me in. So I played in a second time and found myself completely absorbed by it. It is quite basically a tale of horror which later becomes something else altogether so I suppose I have to say it is macabre to a point but it is so much more than that. Allen Dawson inherited an apartment in Santorini, Greece. He learned that his grandmother willed it to him but he had to go to Greece to take care of the property transfer. 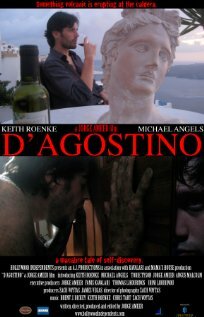 He discovers a human clone in the apartment and decides that it or D’Agostino (who he nicknames Diablo) is to become his new best friend even though the only human quality that the clone possesses is his appearance. We learn that the clone had been on a transatlantic voyage from Italy to America when there was a crash and he had been left for dead. He had been commissioned by men with wealth and was to be used for organ transplants but he had been abandoned. In the meantime, Dawson learns of his inheritance and leaves his home which he had been sharing with his girlfriend and goes to Santorini where he finds the abandoned clone. Through Diablo, Dawson comes to learn more about himself as he decides to make the clone his best friend. Dawson also realizes that his relationship with his fiancée is a sham and that it is going nowhere and he is bored with and upset that he gets nothing out of it. He realizes that he is trapped in a sedentary existence and that his prospects for future happiness do not look good so when he receives news of the inheritance he knows that he has a chance to get away from his him-drum life and travels to Greece alone. He understands that his life has been little more than an obstruction but he is also not quite ready to deal with what he finds. He quickly sees that with his new property his outlook on life changes and then changes once again when he meets D’Agostino. At first Dawson s befuddled by the clone and has no idea of how to deal with him but as the two interact we see that his state of mind becomes quite strange and he becomes both ruthless and cruel but as he gets to know the clone, we watch him become victim to his own moral perversion which later creates a reaction that causes him to fall victim to his actions. How and what that is will be something for you to discover when you see the film and regardless of what I say, there is no way to prepare the viewer for what he sees. The version I was an unedited screener but I could still tell that the cinematography was beautiful and Greece of course leads itself to creating beauty on the screen. Yet when the film is dark, it is very dark. Hats off to the actors who play Dawson and the clone and to Ameer himself in his performance as the man who has been watching the property. I cannot say that this is a film I enjoyed but I can say that it is well done. Enjoy just does not seem the right word to describe it. If you get the chance to see this film, do not hesitate. This entry was posted in GLBT Film on February 20, 2012 by Amos.